There are several scholarships and fellowships available through Georgia State Law, many of which apply to students pursuing specific areas of legal education. These awards are open to a broad range of students and provide financial support or stability while students focus on their studies or practical experiences. This scholarship is a student-supported, student-assisted scholarship fund that is awarded as a one-time gift. The graduating class donates to the Class Gift Fund, which awards a scholarship to a student in the incoming class. The Office of Admissions and faculty scholarship committee select the recipient. The fund is a current-use scholarship, meaning the funds raised by the graduating class must be used immediately, but with time and support from future class gift campaigns, it will become an endowed scholarship. A percentage of the donated money is reserved to build the endowment. The fund accepts contributions from law alumni, law students, parents and friends. Gifts are tax-deductible charitable contributions. Donations can be made securely online at law.gsu.edu/classgift. If contributing by check, please make the gift payable to: Georgia State University Foundation/Law. In the memo section, please write: Class Gift Scholarship Fund. For further information regarding the Class Gift Campaign, contact Ely Abbott, director of development, at 404-413-9022 or ely@gsu.edu. The PILA Fellowship is a grant awarded to a student to work in an unpaid public interest law position during the summer. The amount and number of fellowships awarded vary based on the success of the annual PILA Auction. In 2013, 11 students received fellowships. Learn more about PILA fellowships. Thanks to her 2013 PILA Fellowship, Alexis Person (J.D. 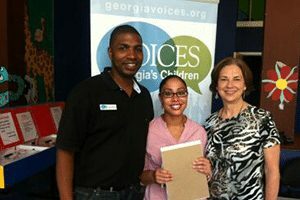 ’15) (center) was able to gain valuable work experience with Voices for Georgia’s Children. The public interest law field is quite broad and covers almost any type of work that helps the public or community. Preferential consideration will be given to jobs that provide legal help to typically underserved segments of the population, such as poor or elderly people. Past recipients have worked with: Georgia Innocence Project, Georgia Center for Law in Public Interest, ACLU, the Atlanta Legal Aid Society, public defenders, environmental law groups and homeless law clinics. Looking for pubic interest opportunities? Visit Equal Justice Works or Public Service Jobs Directory (free registration) for resources and opportunities around the country.